In a large bowl, combine ground ginger, cinnamon, cloves, pepper, allspice and 2 tablespoons sugar; mix thoroughly. Add soy sauce, water, garlic and ginger, mix thoroughly. Add pork ribs to sauce, toss to coat. Place ribs and sauce into a baking dish, roast until tender, approximately 25 minutes. Remove from oven, let cool slightly. Shred cooled pork. Add cabbage, carrots and mushrooms. Mix thoroughly. Return pan to oven and cook until cabbage is wilted and pork begins to crisp, approximately 20 minutes. Remove from oven, let cool. Meanwhile, in a large bowl, combine baking mix, remaining 2 tablespoons sugar, baking powder, yeast, almond milk and vegetable oil. Mix thoroughly. Let rise until dough has doubled in size, about 1 hour. On a floured surface, knead dough until firm and smooth. Divide dough into 12 even balls. Flatten each ball into a ½-inch thick disc. Place 1 tablespoon filling into center of disc. Gently fold dough around filling and pinch at the top. Steam buns until tender, about 10 minutes. 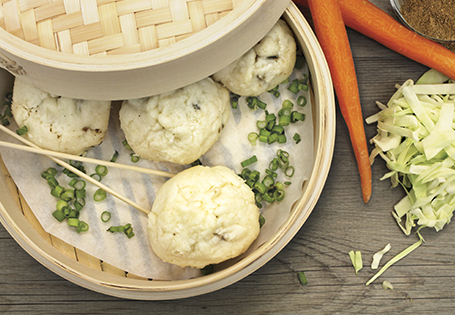 TIP: Strain remaining sauce from pan to drizzle on top of pork buns or serve on the side as a dipping sauce.